Like clockwork, CBC has released EKOS' latest poll results. EKOS has not picked up the increase in the Tory national lead that Angus Reid and Ipsos observed. However, the regional patterns were very similar in these three polls: Ontario is almost certainly a dead heat, while the Liberals are doing well in Atlantic Canada and the Conservatives are making MB/SK look like Alberta. The NDP is at 13.5% nationally in the latter week of the EKOS poll, which drops it to 14.3% in my projection. It looks like the 18% in the Angus Reid poll from yesterday is a bit of an outlier. The average Conservative national lead pulls back slightly to 4.8% 4.7%. The coalition issue increases support by about 3% on each side, so it appears that Canadians are not really afraid of it. However, bringing it up may still help the Tories electorally: while the 3% on the Left are probably mostly electors that would vote NDP anyway, the 3% on the Right might be Liberal/Conservative swing voters that would switch their vote to block a coalition. Indeed, the share of voters wanting a Conservative government is very close to the share of voters that would vote Conservative in every region except Québec (where a few Bloc voters may prefer the Tories to the Grits). Thus increasing the former number by 3% would really suit Stephen Harper, and could make the difference between a loss and a comfortable minority, or a comfortable minority and a majority. Edit: Some weights were not originally assigned correctly. The latest Angus Reid poll is out, and it is a sweet one for the Conservatives: 50% on MB/SK, a 15% lead over the NDP in BC, and a small edge (3%) in Ontario. This is also a good poll for the NDP after much negative news these past few weeks: 18% nationally, with very strong results in Ontario (19%) and Québec (17%), and a bounce in Alberta (14%; incidentally, the Tories did relatively poorly in the Wild Rose province with just 52%). The Liberals, on the other hand, only have one bright spot in this poll: a 17% lead in Atlantic Canada. The big movement, however, is in the popular vote average, where the Tory lead jumps to 5.2%. The reasons why the seat count changed little are that Québec remained stable, and the Ontario numbers didn't move much because this poll significantly reduced the weight on the early September Environics poll that gave the Tories a 10% lead there. In terms of the Liberal-Conservative horse race, this poll is in line with other recent ones in every region except MB/SK, where the Tories have an even larger lead than usual. In particular, the poll shows a dead heat in Ontario, like the recent poll average, but unlike the previous Ipsos poll. The main action in this poll is for the smaller parties: the Bloc gains 5 points in Québec and is at 44%, while the NDP drops to 12% nationally. That puts them in a tie with the Greens, and the NDP trails the Greens in both Ontario and Québec. The 11% in Ontario is especially worrisome for Layton. The Tories, after a brief small dip earlier this month (and a brief small bump early in the summer), are now back to the low 130s, where they have been since recovering from the prorogation flap in early March. The Liberal gains over the summer have therefore mainly come at the expense of the Bloc and the NDP. While the Bloc is still in a strong position, the NDP is now at its lowest projection in 11 months. The Dippers' popular vote projection is a measly 14.6%, compared to 18.2% in 2008 (37 seats) and 17.5% in 2006 (29 seats). The main reason why they are still at 33 seats is that their vote share is holding up in MB/SK and BC relative to their main competitors there, the Conservatives. Indeed, the NDP is projected to lose roughly a third of its seats in Ontario, with more on the line if the Liberals strengthen further. Within Ontario, the NDP's vote also got way more efficient between 2006 (12 seats with 19.4%) and 2008 (17 seats with 18.2%) - our electoral system encourages smaller parties to build small pockets of support, and that seems to be what the NDP has been doing. The average Tory national lead is up to 3.9%. Léger Marketing has a new Québec poll, showing small losses for the Bloc and the Liberals to the profit of the Conservatives and the NDP. This is welcome good news for the NDP amid much disappointment from other polls. More importantly, the Conservative bump was also observed by EKOS last week, and this lends more support to the theory that the Colisée issue has improved Tory fortunes in Québec - the Conservatives have increased their Quebec City lead from 4% last month to 9%. This is the Bloc's lowest projection since late March. The latest Harris-Decima poll has results very much in line with the recent poll average in every part of the country, except possibly in BC, where the Tories do well with 37% at the expense of the NDP at 20%. The NDP's weakness in Ontario is confirmed in this poll (14%), and that's the main cause of their low national support level (also 14%). Harris-Decima agrees with EKOS that the Liberals hold a tiny lead in Ontario; that's probably where we've been all along, and the four freak polls early in the month (3 with a large Liberal lead and 1 with an even larger Conservative lead) likely were a fluke. The last time the NDP was this low was before the Olympics, and the last time it was lower was in October last year. The Tory average national lead increases marginally to 3.2%. The latest EKOS release is out, and the numbers are quite good for the Tories. First, their national lead is comforting, as it appears that the previous EKOS and Nanos both showing a virtual tie was a coincidence, and that Ipsos, Harris-Decima and Environics were right about the 3-4% gap. Moreover, this poll shows a virtual dead heat in Ontario, unlike the previous EKOS and the most recent Nanos and Ipsos, which all showed a sizable Liberal lead - this also makes Environics' 10-point Tory lead in Ontario seem less crazy. Also, the latest week of polling in Québec puts the Tories above 20% for the first time in a while; it's too early to conclude anything yet, but did Harper's half-hearted musings about funding a new Colisée actually attract voters? Finally, Atlantic Canada seems to have tightened back up from inexplicably large Liberal leads shown by most pollsters in August. It's not all bad news for the Grits though: in both weeks of polling, they were in a tight three-way race in BC (a dark spot for the Tories), and while their Québec numbers were essentially flat, the Bloc has shed a few points since the last EKOS poll. For the NDP and the Bloc however, this is a bad poll. The Dippers have to be especially concerned about Ontario: none of the polls released in the past two weeks has put them above 15% there, so their gains from 2008 would likely have vanished had an election taken place recently. They do seem to be back to respectability territory in Atlantic Canada, but are still down from 2008, and while they do not trail the Tories anymore in BC, as mentioned above, the Liberals have caught up. So despite all the good news for the Tories outside BC, their seat count does not increase. However, they consolidate a few seats in Ontario, and are closer to reducing losses in Québec. Similarly, despite all the bad news for the Dippers, their seat count does not decrease, but they have become more vulnerable in a few places. The average Tory national lead is back up to 3.1%. I have now returned to the normal depreciation formula, since all pollsters appear to be back in action. A second poll today! Environics shows the Conservatives leading by 4 nationally, which is not too surprising. But the regional breakdown is pretty wild: apparently, the Tories lead Ontario by 10% (when Ipsos, Nanos and EKOS just told us the Grits lead there by 8%, 7% and 6.6% respectively), and the Liberals are at 33% in Québec (just 5% behind the Bloc), even though most other pollsters put them in the low 20s. The Liberal 30% in BC, NDP 29% in Atlantic Canada and NDP 32% in the Prairies are also pretty high, but aren't that surprising given the small samples in those areas. The average Conservative national lead is up modestly (but still down on the day) to 2.6%. The latest Ipsos Reid poll is out and shows almost no national movement since the last one a month ago. Both the actual numbers and the lack of national movement confirm Harris-Decima's latest finding. Nevertheless, this poll is very significant: it gives the Grits an 8-point lead in Ontario, and confirms Nanos' and EKOS' finding that the Liberals have opened up a sizable lead in that crucial battleground. The Tories recoup that lost territory in MB/SK and BC, but those gains help little in terms of seats. If upcoming polls keep showing a 7-to-8-point Liberal lead in Ontario, their gains in the projection would increase. However, they would remain roughly 15 seats short of the Tories. At that point, a rebound in Québec becomes crucial if the Grits want to tie up the seat count without having to win Ontario by 12+ points. The average Tory national lead is down to 2.3%, mostly on the full depreciation of Léger's rogue poll from early August showing a 9-point Conservative lead. Harris-Decima has released the results of a new poll to The Canadian Press, but the regional breakdown isn't yet available. The national figures held steady from two weeks ago for all parties but the Bloc, who are up one. This post will be replaced, and a new projection made, when the details of the poll are made public. Update: Still no full breakdown, but this article has the Québec numbers. The Grits are down 5, and just like EKOS and Nanos suggest, the Bloc is up. This will move one seat from the Grits to the Bloc in the projection - however, a drop in Québec likely means an increase elsewhere for the Liberals, so I won't update the projection until more details come out. The new projection will show an average Tory national lead of 2.8%. The biggie in this poll, however, is the 7% Liberal lead in Ontario. This is very encouraging for the Grits, especially on the heels of their 6.6% lead there in EKOS' most recent week. The Ontario projection, which had been stuck for weeks, has finally moved in the Liberals' favour. Another storyline is the NDP's weakness: just 13-14% in both Atlantic Canada and Ontario, and third place in BC. Nanos' leadership index remained flat for Ignatieff over the summer, so the recent signs of life shown by the Grits may be due more to the Tories' missteps than to the BBQ tour. On the surface, this is bad news for Ignatieff, but in fact this means there's plenty of room for growth: even with their leader still much less popular than Harper (and not much more than Dion), the Liberals are managing a tie. The average Conservative national lead is 2.9%. This number has dropped 2% in the past 11 days without affecting the seat projection much. However, if it drops another 2%, the seat count would start tightening considerably: the Liberals are at the edge of the high payout zone in Ontario with respect to both the Tories and the Dippers. We're past Labour Day, and Nanos is back. 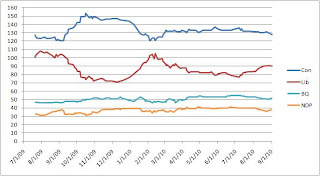 If Harris-Decima, Ipsos and Angus Reid also show signs of life in the next two weeks, and if EKOS returns to weekly reporting, I will switch back to the standard formula, which has slightly faster depreciation than the summer formula. It's been a while since I last updated the projection trends (as well as the maps, but those will have to wait), so I thought that now might be a good time to do it as BBQ season ends. The graph shows the evolution of the aggregate projection since the birth of this blog in July 2009. Picking up the narrative from the last update in December 2009, we see that prorogation brought the Tories down from near majority seat counts and produced a major spike in the Liberal numbers, cutting the gap between the two main parties to as little as 16 seats as the Olympics were getting started. By the time the Olympics were ending, however, the Tories recovered to above 130 seats, while the Grits were down to the low 90s. In the spring, the Liberals continued their gentle slide, but those seats did not go to the Conservatives. Rather, it is the Bloc and the NDP that strengthened their position thanks to Ignatieff's continued weakness. 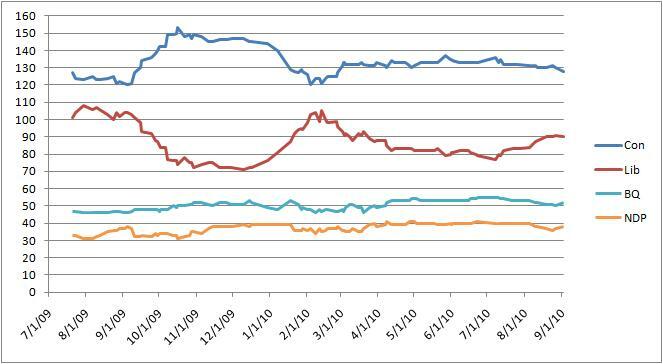 The Tories were for the most part mired in the low 130s, never recovering to their Fall 2009 levels. Finally, during the summer, Liberal fortunes reversed as Ignatieff finally started getting positive press after more than a year of unflattering reports. The Grits drew from all three other parties. Due to their previous rise, the Bloc and the NDP remain strong, but save for the prorogation episode, the Conservatives haven't been this low since around Labour Day 2009. Where do things go from here? The first thing to note is that things are currently in flux. Only two firms, EKOS and Harris-Decima, have released polling from the second half of August, so the current projection is a compromise between mid-summer numbers more favourable to the Tories and the latest numbers more favourable to the Grits. As other pollsters get back into action, the Liberal seat count could quickly slide back to the low 80s or approach 100. Once that's done, my guess is that things will be fairly stable, as they have been since March. I maintain my December prediction that the Liberals will stay above their Fall 2009 lows, but are unlikely to pass the Tories in 2010, except during a general election campaign (which now looks unlikely), where anything could happen. Nevertheless, it'll be interesting to keep an eye on the numbers this Fall: the closer the Liberals get to the Conservatives, the more likely Budget 2011 will be rejected, which would probably lead to an April 2011 election. However, even if Ignatieff pulls even with Harper, he may hesitate to provoke an election given what happened last fall. Moreover, if the Grits actually manage to pass the Tories, that may mean that either the NDP or the Bloc would be much weakened, which could prompt one of them to support the Government or abstain. Scenarios where Harper would call an election on his own in the next six months seem rather remote: his party has not been above 140 all year, and their spells above 133 have been limited to at most one week. But if the economic outlook worsens quickly, the PM may decide to go sooner rather than later and cut his losses. The latest EKOS release shows a tightening race between the two main parties, with a virtual dead heat nationally in the latest week. The regional numbers for this poll are also very interesting: EKOS now agrees with all other pollsters that the Liberals are on a tear in Atlantic Canada, at the expense of both the Tories and the NDP: a little hard to believe, but throughout August, the Grits have been almost as strong in Atlantic Canada as the Tories are in MB/SK. In Québec, however, this poll suggests that the Liberals' inroads have abruptly reversed, and the Bloc is back to 40%+. Ontario showed little movement in the first week of the poll - still a dead heat - but in the second week, the Liberals posted a 6.6% lead. If the latter number holds up in the coming weeks, the projected seat count could start moving significantly. Like Ontario, BC also showed little movement in the first week, but in the second week, the NDP took a 5.5% lead over the Tories, with the Grits close behind, and the Greens at a respectable 18%. Exactly 6 months ago, the Conservatives pulled above 130 seats, and have not fallen below that threshold until today. Their average national lead has also dipped to 3.6%. I don't usually do single poll projections, but given the odd results of the latter week of this poll, I decided to calculate what seat count it would produce. The result: CON 110, LIB 106, BQ 56, NDP 35, GRN 1. Note that in such a parliament, the NDP's support is insufficient to either major party. This means that unless the Tories and Grits govern together (i.e. when pigs fly), either the Official Opposition will need to abstain on confidence votes, or the Government will require the support of the Bloc. Also, I've been saying for a while that due to the low Ontario gap (Liberal Ontario lead + Tory national lead), the Grits are likely to lose the seat count if the popular vote is tied. In this poll, the Ontario gap recovers to a respectable 6.9%, and that produces a tight seat count with a virtual tie in popular vote.